Khandesh the northwestern portion of Maharashtra bore the brunt of Islamic invasions for several centuries. As a result of this, few Hindu temples of importance were constructed here after the 13th Century AD. 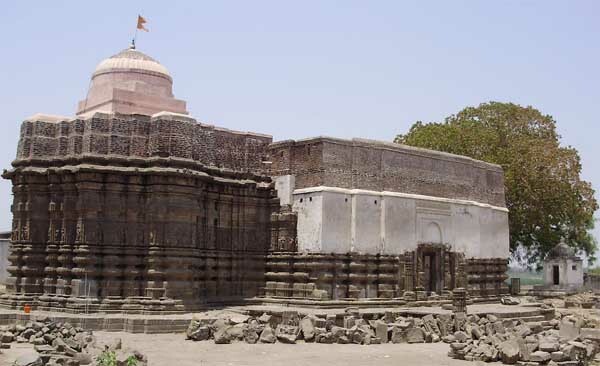 Changdeo Temple is one of the few earlier surviving temples extolling the grand architectural tradition of Khandesh. The shrine is dedicated to Lord Shiva and is also known as Changdev. Changdeo Temple is around 60 km east of Jalgaon and 30 km east of Bhusawal. The nearest railway station is Savda, around 8 km from Changdev. The temple was constructed in 11th Century AD by Govindaraja who was a chief of Deogiri Yadava King Mahamandala Nath Seona or Senu II. The Sun Temple of Vaghli and the Mahadeo Temple at Sangameshwar in the Chalisgaon region were also constructed during the reign. The name Changdeo is not associated with Yogi Changdeo as it is generally perceived. About 15 kilometers from Chalisgaon in a town named Patan a Maheshwar Temple has an inscription which records that Changdeo was a chief of Nilkumbha King Govan. It was under the rule of this Changdeo that the temple was erected. Changdeo also happens to be the name of the grandson of the famous astrologer Bhaskaracharya, who wrote Siddhant Shiromani. Yadav Kind Sindhan bestowed large lands in 1206 AD to Changdeo to study and teach in the surroundings. Shilparatnakar and other manuscripts of architecture were taught here and this may be responsible of the growth of a new vigorous architectural style in the region. Changdeo Temple architecture derived details from various earlier Buddhist monuments, local sources as well as northeastern architectural tradition. The carved stone exteriors of the temple has beautifully carved floral and creeper motifs. The interior is also elaborately carved and finely finished. Buddhist caves seem to provide the architectural prototype for the temple. The temple has well decorated half pillars and pilasters, simple forms of images cusped oval ceilings of antechambers, flora motifs and carved bands on the exterior all developed as a style in this region. The local style of architecture and spiritual tradition were developed here during the 12th century AD. The main structure is built in black stone, carved and fitted without any lime mortar. The whole temple is 32 meters long and 40 meters high. The Sabhamandapa or hall is 14 square meters and has four free standing and four half pillars in each of the four corners. These total sixteen pillars and sixteen pilasters support heavy carved ceiling. The pillars also supported brick super structure. The Sabhamandapa is no longer in its original form. The antechamber has an oval stepping roof with pendant design at the center. The oval form is a unique style of Khandesh. The temple has a heavy and high Shikhara. The walls of the Shikhara are plain on the outside. The external offsets on the wall are further emphasized both at the base and at the top by the exterior banded mouldings. Creepers on the horizontal and vertical carved panes seen in the shrine are a specialty of this region. Another specialty is the lozenge shaped patterns at the base of columns, walls, plinths and cornices etc. During Shivratri, devotees gather at the temple for prayers and then they cook dal bhatti a special dish made from rough fired wheat flour and dal. The region is famous for brass utensils and during fairs it is found in large numbers. The main temple festival is observed on the Shukla Paksha Tritiya Tithi in Magh Month – third day after Amvasya or no moon in Magh Month (January – February). During Solar and Lunar Eclipses, special prayers and pujas are offered here.